This chapter examines how the Daily Nation and the People Daily newspapers in Kenya covered the International Criminal Court (ICC) cases. The research findings show that these two dailies seemed to portray two key prominent political leaders (President Uhuru Kenyatta and his Deputy William Ruto) as ‘worthy victims’ whose rights were grossly violated for being tried at the ICC and the thousands of ordinary Kenyans directly affected by the 2007/2008 post-election violence as ‘unworthy victims’ with little or no mention of the violation of their rights. 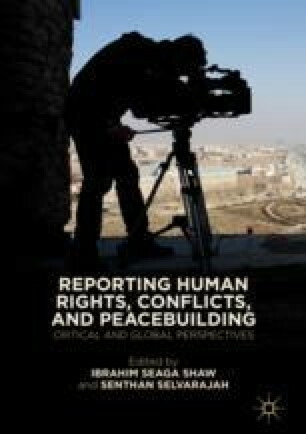 Using Herman and Chomsky’s Propaganda Model, this chapter explores how the political elite successfully used the media to play a propaganda role of portraying the ICC as the perpetrator and enemy thereby denying the thousands of real victims justice. BBC World Trust Policy Briefing. 2008. The Kenyan 2007 and Their Aftermath: The Role of the Media and Communication. Retrieved May 2, 2009, from bbcworldservicetrust.org. International Criminal Court. (2014). Statement of the Prosecutor of the International Criminal Court, Fatou Bensouda, on the status of the Government of Kenya’s cooperation with the Prosecution’s investigations in the Kenyatta case. Retrieved March 8, 2019, from https://www.icc-cpi.int/Pages/item.aspx?name=Stmt-05-12-2014.